Looking for a new car can be an exciting experience. However if you have bad credit, it can be overwhelming and very stressful. And while there are more financing options available today for people with less than stellar credit, if you have filed bankruptcy in the past, the situation can seem even more embarrassing and bleak. Many people find themselves in a state of financial difficulty at one point in their life. Whether caused by job loss, high medical bills, overwhelming debt, or loss of income, it is nothing to be ashamed of – and the good news is that even if you have a past bankruptcy on your credit report, there are financing options available to you. Many consumers with less than perfect credit and past bankruptcies have found the financing that they need to purchase a vehicle online! One very credible option is CarCredit.com. CarCredit.com is a leading provider of car loans and automobile financing for individuals with bad credit, bankruptcy issues and other financial problems. Whether you have bad credit, no credit or past financial or bankruptcy troubles, there are car loans and financing options available to you. CarCredit.com offers new and used auto loans for people with bad credit. If you have bad credit and filed for bankruptcy and you are interested in financing a vehicle, start by visiting CarCredit.com. How is this possible? 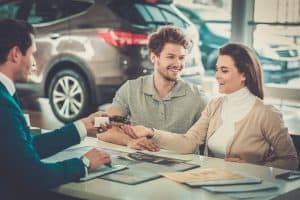 CarCredit.com has strong partnerships with auto dealerships across the nation that offer car loans and new or used car financing options to consumers with bad credit or a past bankruptcy. The entire process is quick and easy. To get started, visit CarCredit.com and fill out the simple, online application on the website. The application is a simple two-step process that takes only minutes to complete. Enter all of your information and within 24 hours, you will be contacted by a car specialist at local auto dealership that can offer you the financing you need for your vehicle. Once you speak with the dealer, they will work with you to find the vehicle that you want and offer you the financing that best meets your financial situation. Before you know it, you will be driving out of the dealership in a new vehicle with an approved car loan! Don’t settle for the fact that you will never be approved for a car loan again. There are options available to you. Start by visiting CarCredit.com and let them help you get the car you want and the credit you deserve.